This post is filed under Beef, Cheese, Cheeseburger, Culvers, Fast Food, Hall of Fame (Taste). I just found out there are Culver’s in the Dallas Fort Worth area. I’m headed there tomorrow to give it a try! I can appreciate your critique of the butterburger’s aesthetic, however, as a butterburger fanatic, I might want to point out two things: 1. a single will look less “fluffy” than a double or single due to the fact that it comes wrapped in the paper upon which you display it. In contrast, a double or triple comes in one of those little blue and white boats so the bun isn’t as smashed. 2. you don’t want the meat to extend beyond the edges! 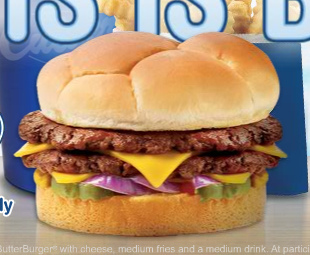 I guess I can understand why they would want to make it look like that for marketing purposes, but if your burger does extend beyond the edges of the bun, usually the means it was pressed too thin by the person on grill making it more likely that you’ll get crispy edges! That’s all– I, too, agree that it is “single best fast-food hamburger in America”– I’ve been eating them since I was a kid! Unfortunately, since leaving the Midwest for Florida, my delcious Culver’s calendar only me makes me miss it all the more. When I saw it was Culvers, I tensed up a little bit. Surely the author wouldn’t slag a butterburger! But when you said “Who cares how it looks?” I knew we were all right, and I let out a big sigh of relief. Of course, now I’m starving for one, so that’s no good. I am a California “In ‘n Out” kinda guy. But, I was in Minnnesota and had a Culver’s burger. Let me say, I will be back! Great taste for a burger! And I gotta say, every burger I’ve had from our Culver’s has been BEAUTIFUL. Even to-go burgers are never smashed, and everything in the burger placed beautifully and symmetrically (which is VERY important, especially for pickles, to get the maximum number of optimum bites). I worked at a Culver’s all thourgh high school. I do have to admit, there food is great, beause it’s all freshly made when you order it. There burgers are amazing!!! I’ve never heard of Culvers until reading this, so I googled it and the one closest to me is in Murray, KY. I live in Clarksville so it’s about 50 miles away. Right you are, I’m livin’ in it up in Chanhassen, MN, 25 minutes southwest of Minneapolis. Culvers? Lions Tap? Must be a native of the Twin Cities! 5 Guys cooks their french fries in PEANUT oil!!! Really bad for you and your arteries. mmmmmmmmm… Agreed! I cry a little bit inside myself every time mine is gone. There isn’t a better fast food burger out there. I usually go for the triple. It tastes so good I just don’t care. If you’re ever out near Portland, OR, stop by Burgerville. Best fast food burgers in the country, hands down, Culver’s is a close second in taste, but can’t compete with the presentation, which is excellent. Ever try 5 Guys Burger and Fries? They make great burgers. Zagat recommended, and the BEST french fries around. Funniest thing is the menu. No frills is an understatement. But you haven’t had Whataburger! It LOOKS good and tastes just as good. Too bad it’s a bit pricey. I eat at Culver’s at least once a week and I normally order the Cheeseburger Snack Pack (burger, smal fries, and small soft drink) and I have Never had a burger served to me looking like the one pictured above (the 2nd pic)! My butterburger always looks fresh and just-made and it always looks great, not like something that was found alongside a dumpster. You should come to the Culver’s in Murray, Kentucky. I work there, and the records show it’s one of the best stores in the system. Also, ordering a basket, rather than a single wrapped, would have improved the looks considerably. I’m sorry, you guys are delusional. 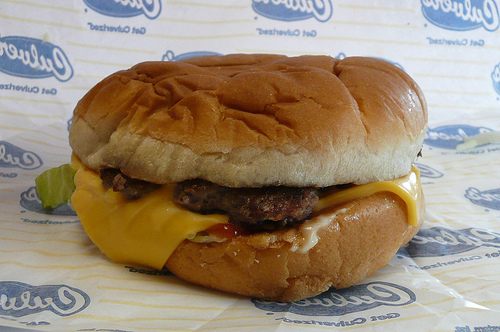 Culvers burgers are terrible. Thin, greasy and taste like they were frozen 6 months ago. ‘Who cares how it looks’ is right, but unfortunately they taste even worse than they look in the second picture. Worst of all, they charge you a dollar or two more for pretty much every item on the menu, when you could go elsewhere and get better food for a better price. High prices and low quality food make Culvers one of the worst places you could choose to eat. 5 Guys is forgettable. I had their burger once, and it tasted like any burger you can get at a chain restaurant. Fries taste like Portillo’s or Russell’s (Chicago places). I think you just might have 5 Guys mixed up with something else. Perhaps you should remove your head from your colon PRIOR to attempting to eat the burger. I can’t think of another that does drive-thru that has the redeeming qualities that these guys do – maybe it’s because they’re regional? More quality control than McDonald’s. I imagine Culver’s and In-n-Out are probably top two for quality, but that’s subjective. I guess Wendy’s will do in a pinch. That’s all I got.